Israel has carried out revenge strikes on Hamas targets in the Gaza Strip, few hours after a rocket fired from Gaza hit a house north of Tel Aviv. The Israel Defense Forces (IDF) said the office of Hamas’s political leader and the group’s military intelligence headquarters were among the targets. Gaza’s health ministry said seven people were injured in the strikes. 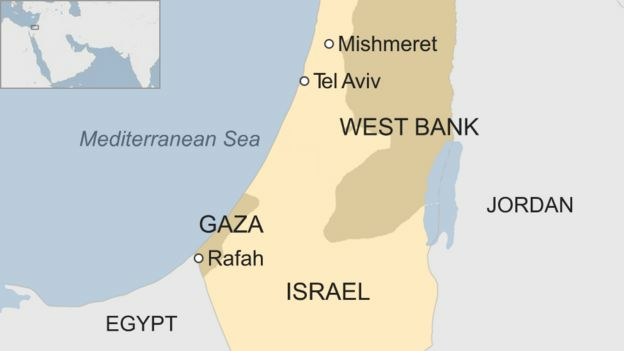 The IDF earlier blamed Hamas, which controls Gaza, for the launch of the rocket that hit the Israeli community of Mishmeret, injuring seven people. “Israel will not tolerate this, I will not tolerate this,” Israeli Prime Minister Benjamin Netanyahu told reporters during a ceremony in Washington at which US President Donald Trump formally recognised Israeli sovereignty over the occupied Golan Heights, which Israel captured from Syria in the 1967 Middle East war. “Israel is responding forcefully to this wanton aggression,” Mr Netanyahu added. He later said he was cutting short his US visit. Mr Trump denounced the attack as “despicable” and said the US “recognises Israel’s absolute right to defend itself”. So far no Palestinian militant group has said it fired the rocket. One unnamed Hamas official said it had “no interest” in doing so. By 22:00 local time (20:00 GMT) on Monday, Hamas officials were telling news agencies that a ceasefire had been reached with the help of Egyptian mediators. Israel did not comment on the claims. The IDF tweeted later on Monday evening that “dozens of rockets” were being fired towards Israel. One house in the southern Israeli town of Sderot was damaged but no injuries were reported. Israel’s Iron Dome missile defence system shot several rockets down and the majority fell in open fields, officials added. What happened on Monday morning? A rocket launched from the Rafah area in southern Gaza hit a house in Mishmeret, about 120km (75 miles) to the north, causing severe damage to the building and setting it on fire. The Israeli ambulance service treated two women who were moderately wounded and five other people, including an infant, a three-year-old boy and a 12-year-old girl, who had minor wounds. The house belonged to Robert and Susan Wolf, two British-Israeli dual nationals, who had been at home with their son, daughter-in-law and grandchildren. “I nearly lost my family. If we had not got to the bomb shelter in time I would now be burying all my family,” Mr Wolf told reporters. It was the furthest a rocket has reached in Israel since the 2014 conflict in Gaza. IDF spokeswoman Major Mika Lifshitz said Hamas – which has fought three wars with Israel since 2008 and is designated a terrorist group by Israel, the US, EU and UK – was to blame for the launch. What has Israel struck in response? Palestinian security sources, media outlets and witnesses said there were strikes across Gaza on Monday evening. The IDF and Hamas’s Al-Aqsa TV said the office of Hamas political leader Ismail Haniya in Gaza City’s Rimal district was bombed. It was not clear whether he was inside at the time. The IDF also said its fighter jets targeted the offices of Hamas’ Internal Security Service, as well as a three-storey building in the Sabra district in eastern Gaza City that served as the “secret headquarters” of Hamas’s General Security Forces, and its General Intelligence and Military Intelligence agencies.